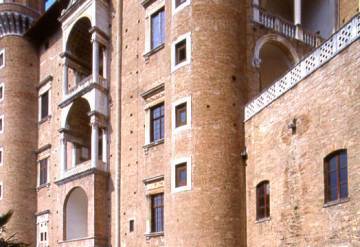 Urbino remains one of the most important towns in the Marche - indeed in Italy - for the tourist in search of great Italian art and architecture and its beguiling streets well reward the curious traveller. Its centro storico now boasts the honour of being included in the UNESCO list of World Heritage Sites. For the second half of the 15th century its windy hill was the setting for one of the most illustrious courts in Europe. Duke Federico da Montefeltro gathered around him the greatest painters, poets and scholars of his day and housed them in one of Italy's most beautiful Renaissance palaces, a palace that still stands as an eloquent memorial to this quintessential Renaissance man. 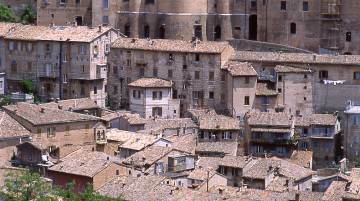 For the best first impression approach the town from Arezzo to see the fairy-tale twin towers of the palace that give Urbino its unmistakable skyline; already you will see that it was built by a benevolent and secure ruler who had no need to intimidate or brag. The hub of the town is the animated triangle of Piazza della Repubblica that lies in a dip between the twin humps of a hill. From here follow the signs up to the Palazzo Ducale. The opening times are 9am to 7pm Tues-Sun, 9am to 2pm Monday. As you arrive at the entrance you may feel let down - the palace presents an undistinguished face to the town. Once inside, however, you will find one of the most kindly and exhilarating palaces you will encounter in Italy. The courtyard sets the tone; a masterpiece of proportion and light carried out with the deftest of touches. Remember this was the first of its kind, the others you will see across Italy are mere copies. None of the rooms of the palace were designed to oppress with grandeur but were built on a human scale and decorated with glad-hearted sobriety. Nowadays they house the Galleria Nazionale delle Marche - a remarkable collection of paintings including one of the world's greatest and most enigmatic images, Piero della Francesca's Flagellation of Christ. Other great pictures here are Piero's Madonna di Senigallia that could almost be an interior painting by Vermeer, Raphael's La Muta, the Silent One, an anonymous portrait of a gentlewoman who we feel might talk to us if she only wished to, and a famous vision of the Ideal City by an unknown hand (possibly Piero della Francesca's) and much used by art designers to illustrate books on the Renaissance. The Duke's Studiolo is the most unusual room in the palace. His tiny study is entirely decorated in exquisite trompe l'oeil inlaid woodwork panels, some based on designs by Botticelli. To understand the complex domestic organisation that propped up what the poet W.B. Yeats called "that grammar school of courtesies", visit the vast warren of cellars, kitchens, laundry rooms, stables and even an ice store in the sotterranei or basements. No single architect can be credited as the creative genius behind this blueprint for the unfortified Renaissance dwelling, although Luciano Laurana and Francesco di Giorgio Martini figure large. It has to be seen rather as the sum of Duke Federico's enlightened patronage. Few traces remain of earlier Roman Urbinum Metaurense - see some in the exhaustive collection of ancient stone inscriptions in the Museo Archeologico on the ground floor of the Ducal Palace - and virtually the entire city within the walls dates from the 15th and 16th centuries; the ghost of Federico would still not lose his way in the maze of pink-bricked alleys. Giovanni Santi was a court painter at Urbino who might have been consigned to the lumber room of art history if he hadn't been the father of the divine Raphael. Few can doubt that Raphael's childhood at the court helped mould his genius. The house where he was born is now a delightful little museum - a simple fresco of the Madonna and Child in one of the rooms may have been one of his earliest works. You will find it in Via Raffaello that runs up from Piazza della Repubblica. 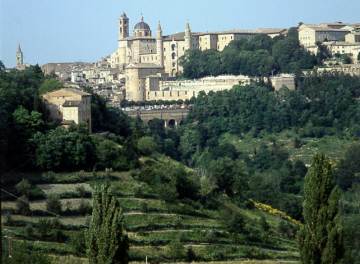 Stagger on up to the summit of the steep hill to find a striking statue of the painter and grandstand views of the countryside around Urbino. If you are not sated with art, hunt out the Oratorio di S. Giovanni Battista in Via Barocci to see a small church entirely decorated in 1416 with wall-to-ceiling frescoes by the Marchegiani painters Jacopo and Lorenzo Salimbeni. Ignore the fact that few outside the Marches have ever heard of the brothers; use your own eyes and enjoy the brilliance of their earthy vision of the life of St John the Baptist and a terrifying Crucifixion - or just count the number of playful small dogs you can spot in the lively scenes. A rarely visited but nevertheless delightful stop is the Orto Botanico. This small, walled botanic garden is full of rare plants, the shade is welcome, and there are definitely no paintings. The entrance is in Via Bramante. As you leave Urbino pause to pay your last respects at the tombs of Duke Federico and his son, Guidobaldo, in the fine church of San Bernardino. It was built in 1491 by Francesco di Giorgio Martini and stands on the hill above the junction for the Pesaro road - follow the signs.